The Academy of Medicine has greatly valued its relationship with the Royal Colleges in the Commonwealth and Ireland. It has also been keen to establish close rapport with our neighbours in the Asean region and with the United States. The Council has always regarded these links as invaluable and representatives were sent from the Council to attend the annual meetings of these organisations. Whenever possible, the Master himself attends as the representative of the Academy. In 1987, in association with the post-graduate medical bodies worldwide, the Academy co-founded Action in International Medicine (AIM) which is a global alliance of doctors, nurses and other health professionals with the object of fostering international co-operation to help poorer countries with medical expertise. At AIM's recent meeting in Toronto Dato' Dr. S.C.E. Abraham represented the Academy in the deliberations to effect aid to under developed countries. More recently it has been possible to hold joint meetings with overseas Colleges and these meetings have been found to be of immense value and have been highly successful. 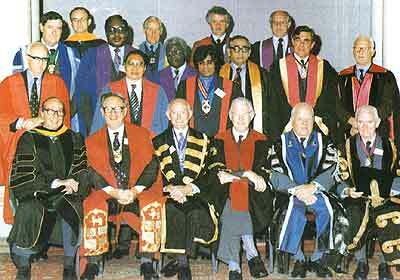 In 1987, a joint meeting was held with the Royal Australasian College of Physicians. In 1989 a similar joint meeting was held with the Royal College of Surgeons of England and this year we are having a meeting with the Royal College of Surgeons in Ireland and the Royal College of Physicians of Ireland. Plans are under way to hold a joint meeting with the Royal College of Surgeons of Edinburgh in August 1993 in Kuala Lumpur. Front Row (left to right): Dr. Stuart Bondurant, Immediate Past President, American College of Physicians ; Sir Alan Parks, President, Royal College of Surgeons of England; Dr. P. Dermot, Holland, President, Royal College of Physicians of Ireland ; Dr. John A Strong, President, Royal College of Physicians of Edinburgh; Sir Anthony Alment, President, Royal College of Obstetricians & Gynaecologists; Mr. James A O'Connell, President, Royal College of Surgeons of Ireland. 2nd Row (from left to right): Sir Douglas Black, President, Royal College of Physicians of London; Dr. Chew Chin Hin, Past Master, Academy of Medicine, Singapore; Dr. Joseph Eravelly, Master, Academy of Medicine, Malaysia. 3rd Row ( left to right): Prof. Frans G. Geldenhuys, President, College of Medicine of South Africa; Dr. Joseph C.O. Mends, President, West African College of Physicians; Prof. Deji Femi-Pearse, Provost, College of Medicine of Nigeria; Dr. Hamid Ali Khan, Vice President, College of Physicians and Surgeons of Pakistan; Dr. Allan Kerr Grant, President, Royal Australasian College of Physician; Mr Douglas H. Clark, President, Royal College of Physicians & Surgeons of Glasgow. 4th Row (left to right): Dr. Lewis W Bluemle, President, College of Physicians of Philadelphia; Professor Emeritus F. John Gillingham, President, Royal College of Surgeons of Edinburgh; Professor Alywn Smith, President, Faculty of Community Medicine of the Royal Colleges of Physicians of the United Kingdom; Dr. G. Ross Langley, Vice-President Royal Canadian College of Physicians and Surgeons. 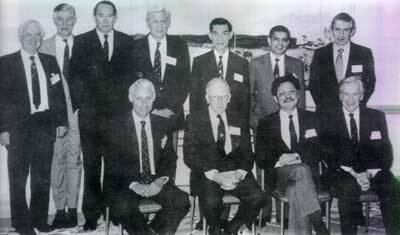 Members of the Council of the Academy of Medicine of Malaysia with invited special guests from foreign colleges at the 19th Malaysia-Singapore Congress of Medicine, 1-4 August 1985. Sitting (left to right): Ybhg Datuk Dr. V. Thuraisingham, Mr. Ng Chuan Wai, Ybhg Datuk Dr. S.M.A. Alhady, Dr. Lim Say Wan, (Master, Academy of Medicine of Malaysia), YAB Dato' Musa Hitam (Deputy Prime Minister of Malaysia), Dr. Lawrence Chan Kok Chin, (Master, Academy of Medicine of Singapore and President of the Congress), Ybhg Datuk K. Pathmanaban (Deputy Minister of Health) Ybhg Datuk Dr. G.A. Sreenevasan and Ybhg Dato' Dr. Mahmud Merican. Middle Row (left to right): Dr. E. Durham Smith (Sr. Vice President, RACS), Dr. Victor Lane (President, RCS,, Ireland), Datuk Dr. Lim Kee Jin (President, College of Physicians of Malaysia), Dr. Syed Mahmood bin Syed Hussein, (President, College of General Practitioners, Malaysia), Prof. John Hickie (President, RACP), Prof. R.H. Girdwood (President, RCP (Edin)), Prof. Patrick Finnegan, (President, RAC General Practitioners), Mr. Ian Mc Gregor (President, R.C. of Physicians and Surgeons of Glasgow), Sir James Fraser (President, R.C.S. of Edinburgh), Dr. victor Fernandez (President, College of General Practitioners, Singapore), Dr. K.T. Singham, Prof. Quintin Gomez (Philippines). Back Row (left to right): Dr. Joginder Singh, Dr. Raj Nambiar, Prof. Chia Boon Lock, Ybhg Dato' Dr. Abu Bakar Suleiman, Dr. Kenneth Chin, Ybhg Dato' Dr. S C E Abraham, Dr. NC Tan, Dr Yeoh Poh Hong, Prof. Alex Delilkan and Mr. Gopal Baratham. Dr. Edward W. Hook, President of the American College of Physicians, with representatives of overseas postgraduates bodies at the 67th Annual Session of the American College at San Francisco, 11th April 1986. Left to right: Prof. Arthur C. Kennedy, President, Royal College of Physicians of Glasgow; Dr. Lim Say Wan, Master, Academy of Medicine of Malaysia; Dr. Edward W. Hook, President, American College of Physicians, Prof David Todd, President of Hong Kong College of Physicians and Dr. Pao Hsii Feng, Assistant Master, Academy of Medicine, Singapore. 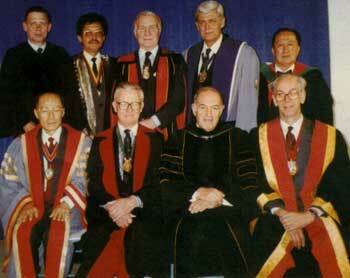 70th Annual Session of the American College of Physicians Convocation on Thursday, 13th April, 1989 at Masonic Auditorium, San Francisco, California, U.S.A.
Front Row (Left to right): Dr. N.C. Tan, Master, Academy of Medicine of Singapore; Prof. John Richmond, President, Royal College of Physicians of Edinburgh; Dr. Ralph O. Wallerstein, President, American College of Physicians; Prof. A. Lindesay Clark, President, Royal Australasian College of Physicians. Back Row (left to right): Dr. Eberhard Ritz, Heidelberg, Germany; Dr. Lim Say Wan, Master, Academy of Medicine of Malaysia; Mr. James McArthur, President, Royal College of Physicians and Surgeons of Glasgow;, Dr. J.A. Myburgh, President College of Medicine of South Africa; Prof. Chieh Ping Wu, President, Chinese Academy of Medical Sciences and President, Chinese Medical Association. Front Row (left to right): Dr. Khalid b Abdul Kadir, Dr. Yeoh Poh Hong, Ybhg Prof. Tan Sri T.J. Danaraj, Prof. Priscilla Kinchard-Smith (President, Royal Australasian College of Physicians), Dr. Lim Say Wan, Yang Berhormat Dato' Chan Siang Sun (The Honourable Minister of Health of Malaysia), Dr. Lawrence Chan Kok Chin (Master, Academy of Medicine, Singapore and President of the Congress), Ybhg Dato' Dr. Abu Bakar b. Dato' Suleiman, Dr. Feng Pao Hsii (S'pore), Dr. Ridzwan Bakar and Dr. Joginder Singh. 2nd Row (left to right): Dr. S. Selverajah (President, College of Surgeons, Malaysia), Mr. E. Durham Smith (President, Royal Australasian College of Surgeons), Prof. Barry baker (Dean, Faculty of Anaesthetists, RACS), Prof. Michael Oliver (President, Royal college of Physicians of Edinburgh), Mr. Ian Todd (President, Royal College of Surgeons of England), Prof. Arthur Kennedy (President, Royal college of Physicians & Surgeons of Glasgow) Dr. Peter C.Y. Lee (President, Hong Kong College of General Practitioners), Dr. David Pyke (Registrar, Royal College of Physicians, London), Mr. Victor Lane, (President, Royal College of Surgeons in Ireland), Dr. Lee Suan Yew (President, College of General Practitioners, S'Pore), Prof. Vikit Viranuvatti (president, Royal College of Physicians of Thailand), Dr. Ruby Majeed (President, college of General Practitioners, Malaysia) and Mr. David Bolt FRCS (President, British Medical Association). 3rd Row (left to right): Dr. Abdul Rahim b. Omar, Dr. Ng Chuan Wai, Dr. Chee Yam Cheng (S'pore), Dr. Kenneth Chin, Dr. G.A. Sreenevasan, Dr. Sam Abraham, Dr. Mahmood Merican, Dr. Tan Yew Oo (S'pore), Ybhg Datuk Dr. V. Thuraisingham and Dr. N. C. Tan (S'pore). Seated (left to right): Mr. Yeoh Poh Hong: Prof. Michael Rosen, President, College of Anaesthetist of United Kingdom; Ybhg Datuk Dr. G.A. Sreenevasan; Sir Ian P. Todd, Immediate Past President, Royal College of Surgeons of England; Mr. Terence A. English, President, Royal College of Surgeons of England; Dr. Lim Say Wan; DYMM Seri Paduka Baginda Yang di-Pertuan Agong Sultan Azlan Shah; DYMM Seri Paduka Baginda Raja Permaisuri Agong Tuanku Bainun; Mr. N.C. Tan, Master, Academy of Medicine of Singapore; Ybhg Dato' Dr. Abu Bakar Suleiman, Sir Raymond Hoffenberg, Immediate Past President, Royal College of Physicians, London; Dr. Ridzwan Bakar; Mr. Derek Seel, Dean, Faculty of Dental Surgery, Royal College of Surgeons of England, Dr. Joginder Singh. 2nd Row (left to right): Prof. Thomas S. Reeve, President, Royal Australasian College of Surgeons; Prof. A. Barry Baker, Dean, Faculty of Anaesthetists, Royal Australasian College of Surgeons; Mr. James Mc Arthur, President, Royal College of Physicians and Surgeons of Glasgow; Prof. David Todd, President, Hong Kong College of Physicians; Dr. John G. Kirker, President, Royal College of Physicians of Ireland; Mr. Desmond V. Kneafsey, President, Royal College of Surgeons in Ireland; Dr. Denis C. Moriarty, Dean, Faculty of Anaesthetists, Royal College of Surgeons in Ireland; Dr. Leonardo Ona Jr., President, Philippine College of Surgeons; Dr. Koh Eng Kheng, President, College of General Practitioners, Singapore; Dr. Kamol Sindhvananda, President, Royal College of Physicians of Thailand; Dr. Ruby Majeed, President, College of General Practitioners, Malaysia; Ybhg Dato' Dr. S.C.E. Abraham, Vice-President, College of Physicians, Malaysia; Ybhg Dato' Dr. S. Selvarajah, President, College of Surgeons, Malaysia. 3rd Row (left to right): Mr. R.M. Kirk, FRCS; Mr. A.H.C. Ratliff, FRCS; Mr. R.J. Heald, FRCS; Miss Phylis A. George, FRCS; Dr. Kenneth Chin; Dr. A. Puraviappan; Mr. D.I. Evans, FRCS; Prof. G.R.Seward, FDSRCS; Prof. J.P. Blandy, FRCS; Prof. Robert Owen, FRCS; Dr. Tan Ser Kiat (Singapore). 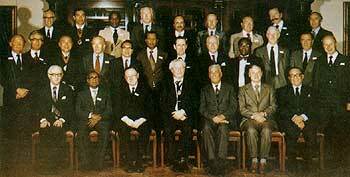 4th Row (left to right): Mr. J. Rayne, FDSRCS; Mr. P. M. Yeoman, FRCS; Sir Keith Ross Bt, FRCS; Prof. J.D. Hardcastle, FRCS; Ybhg Prof. Dato' Khalid bin Abdul Kadir; Ybhg Dato'Dr. Abdul Hamid bin Abdul Kadir; Mr. H.B. 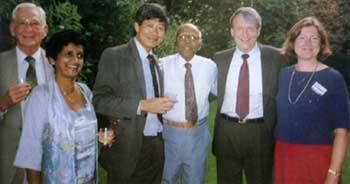 Devlin, FRCS; Dr. M. Jegathesan; Mr. A.W.F.Lettin, FRCS; Prof. M.H.Irving, FRCS. Royal Australasian College of Physicians - College Dinner on Thursday, 3rd May 1990 at the National Gallery, Melbourne. Standing (left to right): Prof. Tom Reeve, President, Royal Australasian College of Surgeons; Mrs. Wilson, Mrs. Elaine Clark, Prof. Lindesay Clark, Immediate Past President, Royal Australasian College of Physicians; Prof. John Chalmers, Incoming President Royal Australasian College of Physicians; Dr. Lim Say Wan and Prof. H.K. Muller (Tasmania). Sitting (left to right): Mrs. Mary Jo Reeve and Dr. P.D.G. Wilson, President, Royal College of Physicians and Surgeons of Canada. Dr. Ridzwan Bakar (extreme left) and Mr. Yeoh Poh Hong (fourth from right) with Professor Stephen Doyle and council Members of the Royal College of Physicians of Ireland, 18 June 1991. (From left to right), Back Row: B Mc O'Brien, Vice President, Royal Australasian College of Surgeons; W. Hederman, President, Royal College of Surgeons in Ireland; Sir Terence English, President, Royal College of Surgeons of England; A. Myburgh, Past President, The College of Medicine of South Africa; T. Limsila, President, Royal College of Surgeons of Thailand; R. Nambiar, Master, Academy of Medicine, Singapore; J. Hanrahan, President-Elect, Royal Australasian College of Surgeons. Front Row: G. Chisholm, President, Royal College of Surgeons of Edinburgh; T.S. 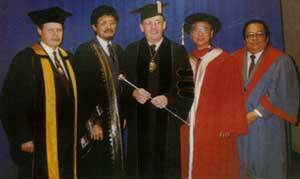 Reeve, President, Royal Australasian College of Surgeons; S.W.Lim, Past Master, Academy of Medicine of Malaysia; P.D.G. Wilson, President, Royal College of Physicians and Surgeons of Canada. The Academy was represented by Ybhg Dato' Dr. S.C.E. Abraham (fourth from left).